I'll be honest, I'm not the biggest fan of radishes. I got a bunch of them in my weekly CSA box and decided to make roasted radishes in the same way I used to roast potatoes. Before the world decided potatoes were evil and I jumped on the bandwagon with my pitchfork in tow. So, I sadly grabbed my bunch of radishes and tearfully placed them on a cutting board. After wiping away my tears, I cut the greens off the radishes. I saved the greens and used them as a bed for the radishes. Rinse the radishes and the greens, as they can have dirt lodged in the crevices. Once you've rinsed and drained them, cut the radishes in half. I seasoned my radishes with fresh thyme and some Herbs de Provence (a French seasoning blend that can be found at some grocers and at most specialty food stores like Sur La Table and Williams Sonoma. There are some recipes online for making your own mix too, just google Herbs de Provence). Place the radishes on a baking sheet, sprinkle them with the herbs and spices, drizzle enough olive oil to coat them and pop them in a 400F oven for 25-30mins. Oh, and I also sprinkled a few red chili flakes on them to bring out the natural peppery flavor of the radishes. This part is totally optional. I recommend this step if you like spicy food. I almost forgot about potatoes. Cut the radishes in half and place on baking sheet. Sprinkle on the thyme, herbs de provence, S&P and red chili flakes. Drizzle on enough olive oil to coat the radishes. Stir to combine. 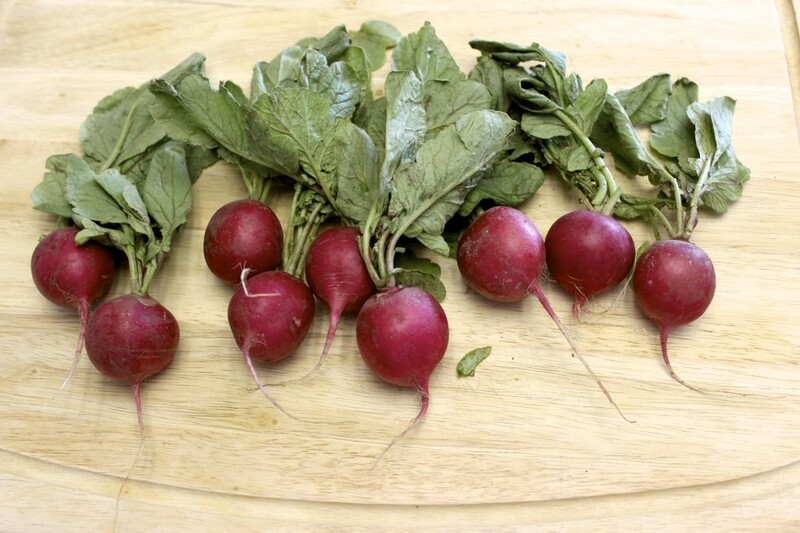 Bake for 25-30 minutes or until the radishes are tender. Enjoy over the radish greens, mixed baby greens or as a side dish on their own.